Trees are frequently used as both walls and ceilings for outdoor living spaces. 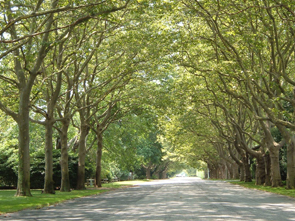 Establishing trees correctly is a long process that will yield great benefits years down the road. I like to say that we can enjoy our lawn, annuals and perennials, our children can enjoy our shrubs, and our grandchildren can enjoy our trees. According to Dr. Edward F. Gilman of the University of Florida, the foremost authority on arboriculture in the country currently, the proper pruning and shaping of your trees takes 25 years to accomplish. His website provides step-by-step procedures for pruning your trees and shrubs. I recommend starting with the link ‘Design a Plan’ located at the bottom of the page. His website also has several other useful links for designing your landscape in Utah or anywhere else in the country. So browse the website and utilize the tools there to help you design your own outdoor living space. « Don’t Miss the Conversation Because You’re Outside Grilling!